ICICI Pocket is Running an Amazing Add money offer for New Users. ICICI Pocket Give this offer only first 10000 customers. This Offer Use only once/User. This offer vaild first time money loaded in ICICI Pocket. So Use ICICI Pocket App and Get Rs.50 Extra on Adding Rs.250 or more Recharge and Bill Payment. 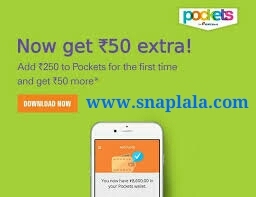 Pocket app Offer 50 Extra on Rs 250 money Adding. It means you will get Rs 300 on Adding Rs 250 money only. 3. Enter Rs. 250 or more amount. 6. Select your Payment mode and add successfully. 8. This Offer is valid Only 20 May to 28 May 2016. 9. This offer Applicable for Old Customers. 10. Offer vaild only money adding in ICICI Pocket Wallet. 1. This offer Vaild for Old/New Users. 2. This offer work unlimited times in Single Device.